Compact design with hook + compass, so you can freely attach it to your backpack when mountaineering, camping, hiking, fishing, outdoor adventure and other outdoor activities. 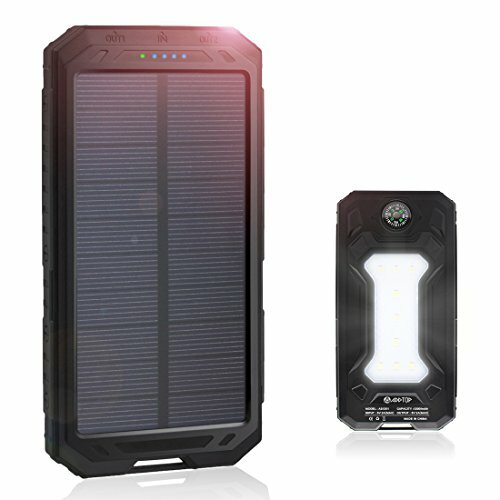 12000mAh Solar Charger can fast charge iPhone 7 for 4.5+ times, an iPhone 6 for 5+ times, Galaxy S6 for 3+ times, iPad mini for 1.8 times. provide enough power for your phones. Quick charging 2 devices at optimal current(such as iPhone and iPad) simultaneously. The charger will stop to charge your phone automatically after the phone was fully charged, protect your device from over-heating and over-charging. so it is recommended to charge by wall charger,which only takes about several hours. 12000mAh Solar Charger: It can fully charge your iPhone, Samsung for 5-6 times. Compatible with all the phone models, including iPhone 6 6s 7 8 7Plus, Samsung Galaxy S7 S6 / Edge / Plus, Android HTC, Sony, Nexus, HUAWEI, XiaoMi, etc. Portable to carry: 12000mAh Li-polymer battery, body size 5.8x3x0.59 inch, easy to hold in hand and put to anywhere your want. Shock-proof, dust-proof. You can hang it on your backpack for long flights, road trips, hiking, camping, or such. What You Get: 12-months warranty, any questions, please feel free to contact us. For your safety, ADDTOP power bank provides multi-protections to protect itself from overload, overvoltage, overcurrent, overcharge, over-discharge, over-heating.